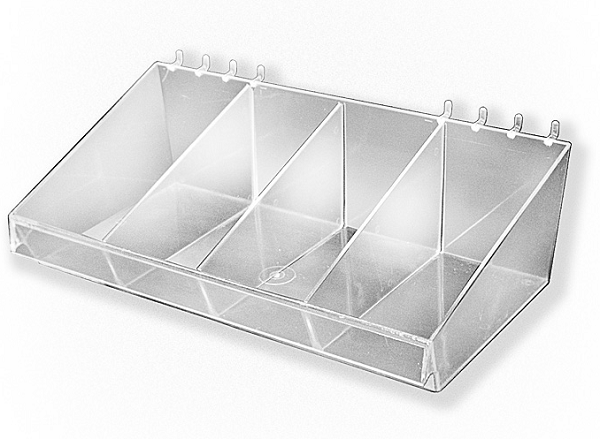 The Large Plastic Divider Bin comes as one single display fixture. Add the optional dividers to turn this accessory bin into a multiple holding containers. Our plastic display container is constructed of highly durable crystal styrene materials giving you an optimal view of the products displayed. This multi-functional bin can be used for an assortment of candy or small hardware parts. Simply add to your existing slat wall or pegboard setup for a show-stopping display. Customers will gravitate towards the crystal clear plastic just to see the surprises held within. They will be giddy with excitement when they see their favorite candies or other products. Place these bins on your slat wall checkout display to create an impulse display showing products customers don't even realize they may need or want. Sit back and watch your impulse sales shoot to the moon. Order your American made retail store displays today!